When I asked KJ if she could mention on her blog that Escape from Behruz is on sale for 99¢, she asked, “Is there any music in the story, because I have this Monday morning music thing…” and I said YES. The heroine Olivia is an acclaimed violinist back home, but since she didn’t have her violin with her while she lived in Behruz, she studied a traditional instrument of the region, the dotar. Here’s a scene from the book in which she plays the dotar. Olivia and the hero (and a baby and a puppy) are traveling through the mountains with a group of nomads. One evening, when everyone is gathered around a communal fire, one of the nomads starts playing his dotar. Olivia hurries to get her own dotar from her tent. The nomads watched and commented as Olivia expertly adjusted the strings. When she was ready, she had Saddiq ask the musician if she could play with him. The old man smiled a shy, toothless smile and bowed his assent, and someone brought a rug for Olivia. She sat listening for a while and then joined in, harmonizing with the melody and adding little strums of rhythm. The rest of the camp had joined the circle. Everyone was quiet, even the children. Rashid [the hero] stood spellbound. No one spoke for a while after the song ended, then they all spoke at once. “They want you to play an American song,” Saddiq told Olivia. Rashid told him it was a goose that died. “Oh.” Saddiq chuckled. “That’s what I thought she said.” Saddiq translated the verse into Qashami and the nomads all laughed. “They think it’s funny that Americans have a song about a goose dying,” he said. Rashid smiled because the song was, indeed, silly and because the nomads’ reaction to it was delightful and because Livie would soon be in his arms again. After each of the remaining verses, Olivia and the old man strummed softly while Saddiq translated for the others. When the song was over, everyone clamored for more. “Okay,” Olivia said. “This is a song about the freedom of living and riding in open country like this. It’ll probably make more sense to you than the song about a dead goose.” She strummed a more forceful beat and stronger melody and sang Don’t Fence Me In. She sang all three verses, repeating the chorus after each one and pausing to allow for translation. The twangy sound of the dotar made a perfect accompaniment to the old cowboy song. Everyone seemed awestruck. “They can’t believe the Americans have a song about them,” Saddiq said. “More, more, more” everyone cried. Olivia recognized the Qashami word for more without waiting for Saddiq’s translation. “Okay, one more. This song was written over a hundred years ago, and it’s still popular at weddings today.” The title is Let Me Call You Sweetheart. She started with a fast, cheerful beat, belying the message and not stopping for translation, but when she sang the chorus for the last time she slowed the pace. She sang to Rashid, twisting his heart with the promise of the words. The nomads were quiet, listening and watching the emotions flow between Rashid and Olivia. 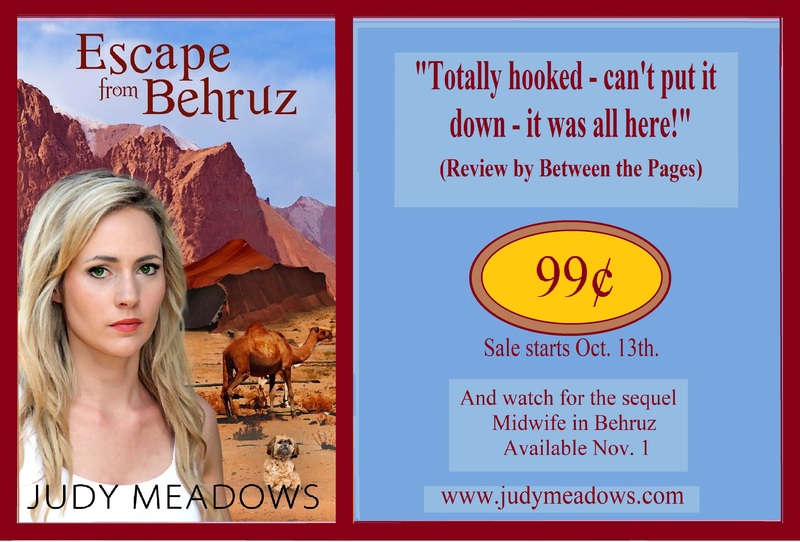 Escape from Behruz (a spicy Contemporary Romance, www.judymeadows.com) is on sale for 99¢!!! This entry was posted in Authors, Monday Morning Music and tagged Andrews Sisters, Bing Croby, Burl Ives, Don't Fence Me In, Dotar, Dutar, Escape from Behruz, Go Tell Aunt Rhody, Judy Meadows, Let Me Call You Sweetheart, Pat Boone, Romance, Shirley Boone. Bookmark the permalink.